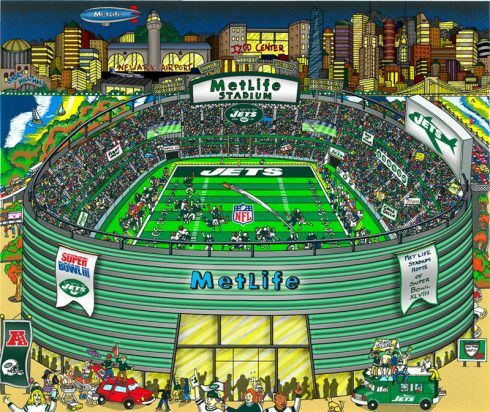 On the heels of the great win by the NY Jets this weekend over the Buffalo Bills (sorry Bills fans), we are proud to announce the release of Charles Fazzino’s latest 3D pop art edition for the NFL – J…E…T…S….Jets, Jets Jets! This new rendering features the new stadium and pays homage to the Jets team of the future! Go Jets! Contact your favorite Fazzino authorized gallery or email us for more information. And visit the Football Art page to see the rest of the Fazzino football 3d art collection.